coconut milk | Cooking is Fun … Really!! 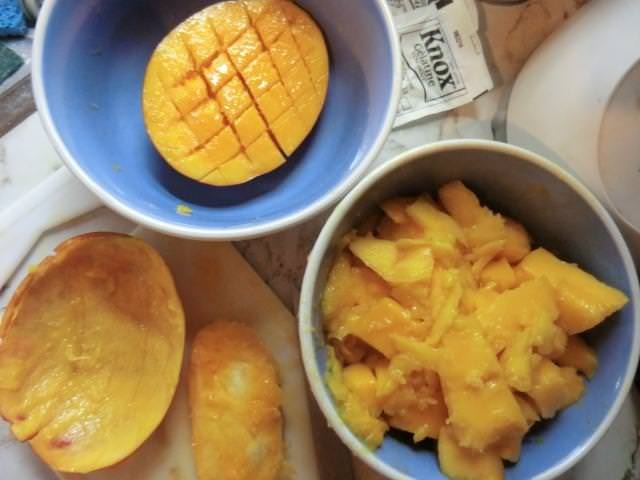 A picture of some lovely ripe mangoes (88 cents each) in the most recent Food Basics flyer led me to consider making either mango creme caramel or a mango panna cotta. I decided on the latter since it didn’t involve turning on the oven. In the current heat wave, even with the A/C on, that’s an important consideration. 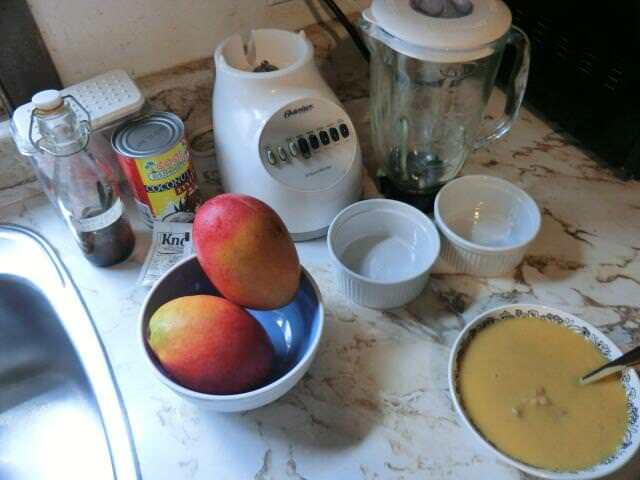 I was able to get a couple of cups of a smooth and tasty mango puree from two mangoes. And, using a can of coconut milk in place of whipping cream let me get some extra flavour into the creamy dessert while reducing the calorie count. 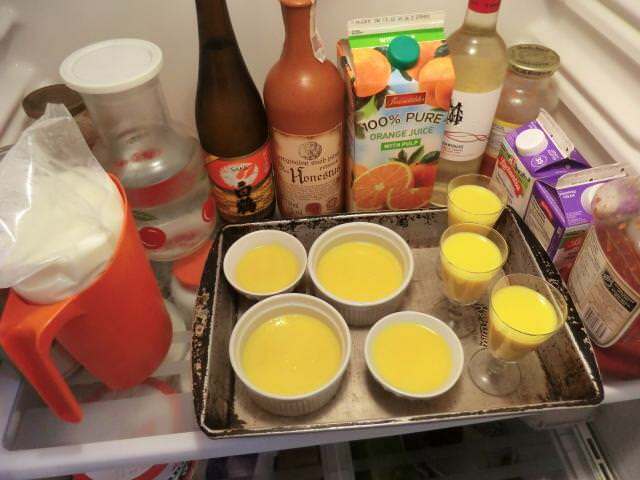 Based on the proportions of gelatin and mango puree I found in a recipe on line, I came up with a recipe. And then I had to adjust THAT since my panna cotta didn’t set enough to turn out cleanly. The recipe below is a bit awkward but uses amounts of coconut milk and mango puree that minimize wastage or leftovers. Once I get through all this test batch of panna cotta, I’ll play with reducing the recipe to something that’s more practical for a single person. 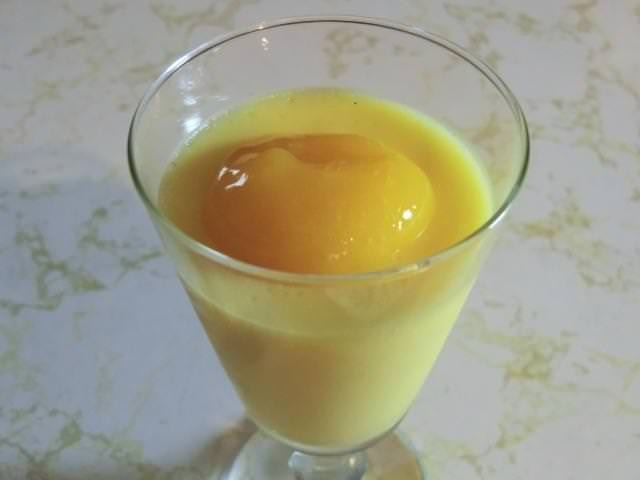 * Two good sized ripe mangoes, diced and pureed in a stand blender, with as much juice as gathered while cutting and peeling the mangoes, should give you about 2 cups of mango puree. Taste the puree and, if needed, add a tablespoon or two of additional sugar before using. ** If using some other thickening agent, ie agar agar or sheets of gelatin, use enough to set 3 cups of liquid. Scald the coconut milk. Pour into a large bowl and stir in the sugar until dissolved. Let cool until just warm to the touch. Stir in the vanilla extract and salt. Divide among as many small ramekins as desired. Portion size may vary from 1/4 to 1/3 or even 1/2 cup. Tap the bottom of the container, very gently, on a flat surface to release any bubbles in the panna cotta. If using fragile glasses, you may not wish to risk breakage so skip this step. Refrigerate for a minimum of two hours, but preferably overnight, before serving. NOTE: If you wish to turn out the panna cotta, lightly oil the ramekin with a neutral tasting oil. Otherwise, just pour into a pretty cup, let it set, and serve directly out of the cup. 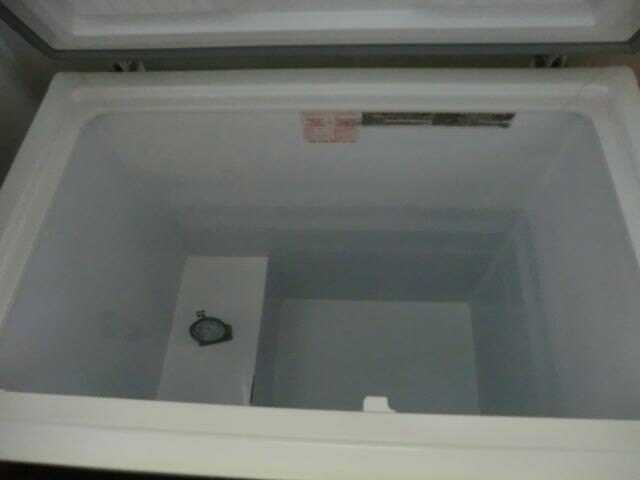 Freezer Defrost Status: Before and After … as of July 1st, this is my upstairs freezer. I haven’t made one of these simple recipe posts in ages. Perhaps I’ve been overwhelming everyone with all the pictures and information. I’ll try to do better in the future. 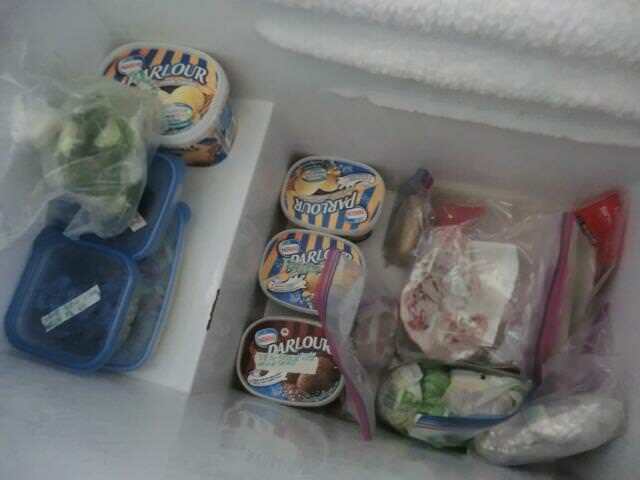 I’m eating out of the freezer these days so I’m not doing much cooking. One of the goodies I found was a two serving container of leek and ground pork mapo tofu, so I made a pot of long grain rice to serve it over. 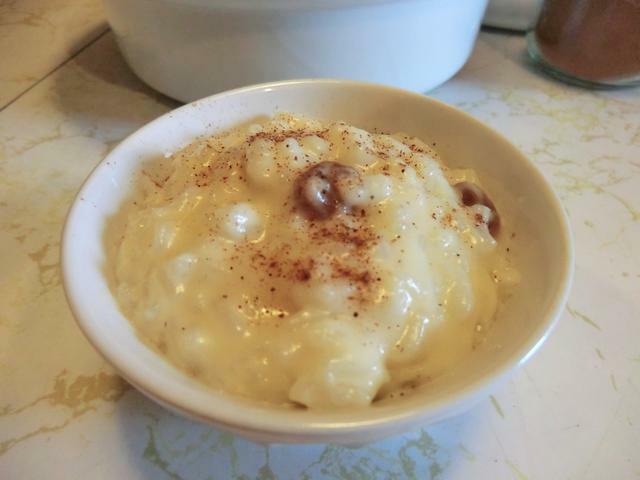 I used half the rice for a comfort dish … rice pudding. The cold rice was combined with some odds and ends in the fridge … coconut milk and whipping cream. After the fact, I realized that I could have used some of the sweetened condensed milk in my fridge in place of the sugar in the recipe. Something to remember for the next time. Remove from the stove and take out the cinnamon stick and discard. 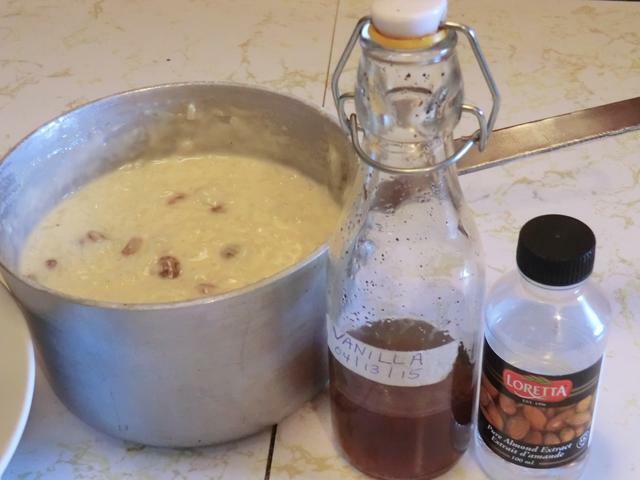 Stir the vanilla and almond extracts into the rice pudding. 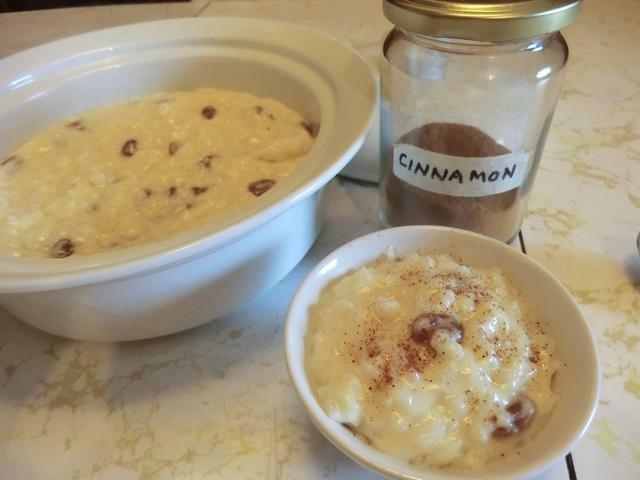 Serve warm (or cold) with a pinch of ground cinnamon over the top.